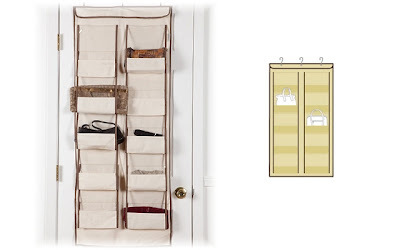 Currently, quite a few of my handbags are stored in our bedroom closet in one of those vertical hanging sweater organizers. It was working out great until I started to run out of room and was required to cram two or more bags in each cubby. Also, Todd recently started a new job that requires him to dress in shirt, ties, and suits. So now I need to figure out a way to free up some space in our closet. The trick is that I would rather not have to hang my leather bags by their handles because it could ruin them. I looked on quite a few sites for the right kind of purse storage for me and finally came across this Over Door Purse Organizer on The-Cover-Store.com . Not only does it not require me to hang my bags by the handles, but its pockets are not completely clear, which I think makes everything look neater. This organizer has 10 slots, which is plenty for my needs. I also think $19.99 is a fair price for such a product. This purse organizer could be the answer to my problems!